5001621 Han Solo (Hoth) is a Star Wars promotional polybag released as part of LEGO's annual "May the Fourth" promotion in 2013. It was available only on May 4 and 5. It includes an exclusive redesigned Han Solo minifigure. Han comes both with a hood and his hairpiece. 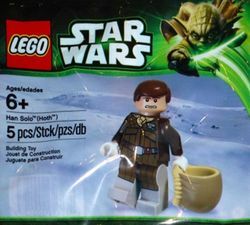 In order to obtain this minifigure, a person had to spend $75 or more on Star Wars merchandise on LEGO.com or at a LEGO Store. Facts about "5001621 Han Solo (Hoth)"